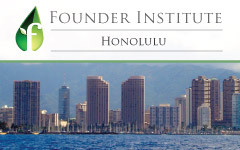 The Founder Institute, the world’s largest startup accelerator with over 800 graduate companies, is announcing its launch in Honolulu. After testing demand in the market for several months, the Founder Institute was able to recruit enough candidates interested in launching a technology company with the program. In order to celebrate the launch, the Honolulu Founder Institute has scheduled several free events where attendees can meet local entrepreneurs and learn more about the program. The Founder Institute is a part-time, four month training program where aspiring entrepreneurs can launch a company with expert feedback and support from experienced startup CEOs, while not being required to quit their day job. The program aims to help launch over 20 meaningful and enduring technology companies per year in Hawaii, filling the gap between idea formation and starting a company that first-time technology founders currently can experience in Hawaii. Anybody who is interested can apply to the Honolulu Founder Institute. Final Applications are due on June 30th, but those who apply by the Early Application Deadline on June 2nd are eligible for a variety of scholarships – including the Female Founder Fellowship, which is offered to the best overall female applicant. The program is open to existing and prospective technology founders of all kinds – with or without an idea, young or old, and with a full-time job or unemployed. Russel Cheng and Brent Kakesako will lead the Honolulu Founder Institute. Russel is the Founder of StartupHui, the Interim-COO at NoJuice.com, and has founded six companies (with two successful exits). Brent is COO of the Hawaii Alliance for Community-Based Economic Development (HACBED), and is a Co-Founder of Cultivating Collaboration & Collective Change organizations. Both Co-Directors currently serve as volunteer entrepreneurs in residence at the local universities and at Punahou School. Learn more about the Founder Institute at http://fi.co. The Founder Institute is an early-stage startup accelerator and global launch network that helps entrepreneurs create meaningful and enduring technology companies. Through a part-time four-month program, existing and prospective founders can launch their dream company with expert training, feedback, and support from experienced startup CEOs – while not being required to quit their day job. Our unique Graduate Liquidity Pool also enables graduates and mentors to share in the equity upside of each graduating class, creating local, teamwork-based ecosystems where new businesses can flourish. In just three years of operation, the Founder Institute has helped launch over 800 companies across 42 cities and five continents – making us the world’s largest startup accelerator. Our goal is to “Globalize Silicon Valley” by launching 1,000 meaningful and enduring technology companies per year in over 75 cities worldwide.